The Emergency Wreck Mark is primarily used to mark new wrecks that pose a hazard to navigation until the danger has been permanently marked by the appropriate buoys and promulgated in the Notice to Mariners or has been cleared for safe navigation. They may also be used to mark other new dangers besides wrecks including newly discovered rocks or reefs that pose a danger to surface navigation. They are placed as close as possible to the hazard and often more than (1) mark is used being placed in a pattern around whatever the hazard. Emergency Wreck Marks are specifically designed to provide high visual recognition. 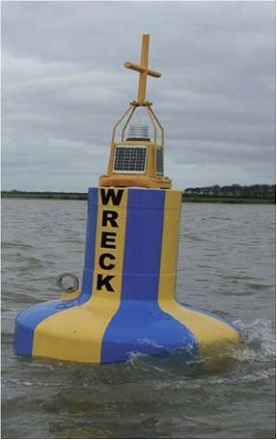 Shapes - The Emergency Wreck Mark can be found in (2) basic shape configurations: A Combination/Pillar Buoy or a Spar Buoy which are typically lighted. The size of the mark being dependent upon its location. Markings - In most cases the Emergency Wreck Mark is marked with the word “Wreck.” However, they may carry no markings at all in limited cases. Colors - Color markings consist of an equal number Blue and Yellow vertical stripes, making it easily distinguishable during daylight hours. The minimum number of stripes will be (4) and the maximum (8). 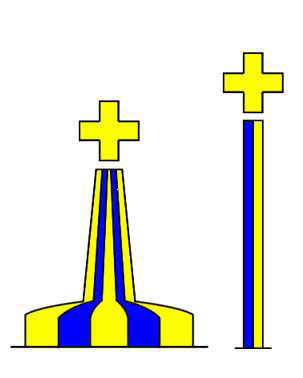 Topmarks - The only topmark authorized is a St. Georges (upright) Yellow Cross and will always be shown regardless of the shape of the mark used. Light Characteristics – The light characteristics were chosen to immediately draw attention to the mark. At night or during the hours of darkness, the mark will show a Blue and Yellow Light. The lights phase characteristics are Alternating. Typically Blue 1.0s + 0.5s darkness + Yellow 1.0s + 0.5s darkness. This will provide a Period of 3.0 Seconds for this light. It then repeats itself. When multiple marks are placed on the same danger, the lights will be synchronized. Special Aids - They may also be equipped with RACON’s transmitting the Morse code letter “D” for Danger (▬ ● ●) or an AIS transponder, or both. These special aids are used to further aid in detection and recognition. While authorized for usage in IALA-B, the Emergency Wreck Mark is not currently being used in United States. There are a number of publications available to help in identifying Aids to Navigation including: The USCG Light List, NGA List of Lights, and Chart #1. You can download these for free on our website or you can obtain the printed versions through many links on our website. Regardless, they should be carried on your vessel as part of your navigation library.